WAUWATOSA, Wis. -- An accessible nature trail will be built in the Wisconsin Department of Natural Resources woodland located in Wauwatosa. The Forest Exploration Center (FEC), the nonprofit organization that manages the site, has hired a contractor to begin the trail improvement project in early August. 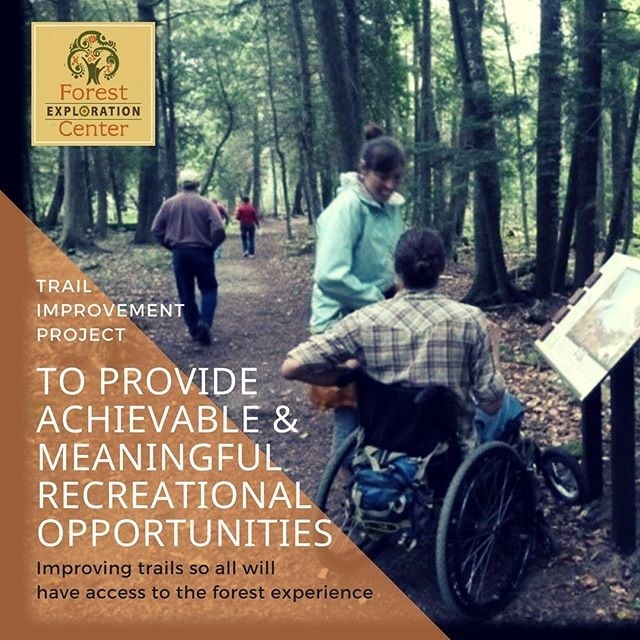 Over the next few months, the center will rehabilitate the existing trail network in the woodland to create a recreational trail experience that is compliant with Americans with Disabilities Act accessibility guidelines. "Installation of an ADA compliant nature trail will provide access to the woodland so all abilities may access, explore and enjoy the forest," notes Mary Ann Buenzow, DNR district forestry leader and DNR's representative on the FEC board of directors. "The trail will comply with the ADA accessibility guidelines and will provide approximately three-quarters of mile of firm, stable, compacted crushed natural stone surface that is wheelchair accessible throughout the hardwood forest," according to project manager Julie Hein. "This new experience will allow visitors the opportunity to access and connect to all areas of the property and to experience the subtle changes and beauty found in each forest stand." "Trail wayfinding signs, maps, kiosks and educational signs along the trail will allow individuals of all ages and abilities to explore and learn about the forest environment. Technology will be available for visitors with visual impairments to provide audio description for the educational exhibits and the surrounding forest landscape," Hein added. Although currently not accessible, trails will remain open during installation. The trail will be built in sections and signs will be posted along those sections of trail that are under construction. Trail work is anticipated to take a few months. As trail installation progresses, FEC will offer volunteer opportunities on their social media sites. Interested individuals are invited to sign up to receive newsletters at the FEC website. The focus for the Forest Exploration Center is to deepen understanding of sustainable forestry for current and future generations. The center strives to provide a unique woodland learning environment where meaningful opportunities in forestry education, recreation and stewardship are accessible to the broadest audience. Learn more about the Forest Exploration Center on its website, www.forestexplorationcenter.org, Facebook page www.facebook.com/forestexplorationcenter and Instagram account www.instagram.com/forestexplorationcenter (all links exit DNR).